Welcome to Must Read, where we single out the best stories from around the automotive universe and beyond. Today we have reports from Motoramic, Hemmings, and NASCARnomics. Great history from former Jalop Justin Hyde. Last week's promotion of Mary Barra to chief executive of General Motors marked a major milestone of the first female CEO of a global automaker. What may be just as remarkable was how Barra made the climb: as a mechanical engineer, a field once all but closed to women in Detroit. 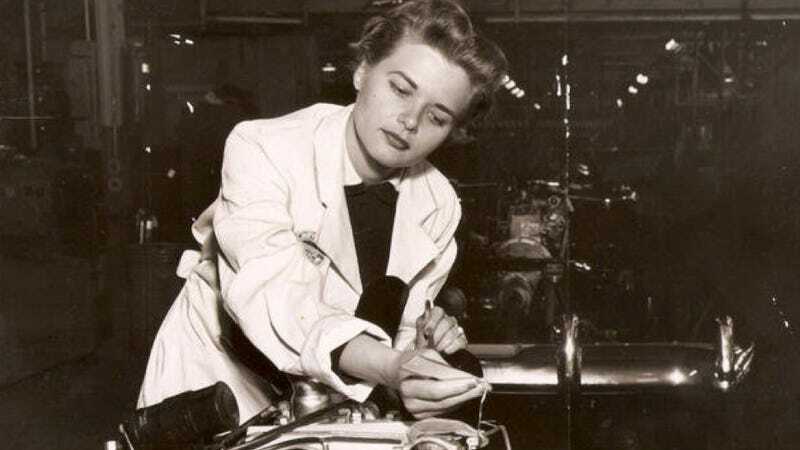 Sixty years ago, the Motor City's most well-known female engineer was promoted for her looks into a television model rather than allowed to work in the field she'd chosen — and the forgotten history of Lucille Pieti, once dubbed "Chrysler's Most Beautiful Engineer," demonstrates what's changed, and what hasn't. Another fine history of a pioneer who recently passed. Most young hot rodders who know nothing about auto mechanics tend not to go anywhere fast, but Stuart Hilborn had a couple aces up his sleeve – a neighbor who ran at Indy and a college education – and he would use those to good effect to become a legend in high-performance automotive fuel-injection systems. That legend died Monday morning at the age of 96. NASCAR is going to NBC/NBC Sports in 2015. If IndyCar is any judge, it might not be the best move. I recently shared a graph which charts the television ratings for INDYCAR's IndyCar Series from 1996 through today. I plotted each race's U.S. Nielsen rating and calculated the one-year moving average for the series' household audience.